I've always loved dreadnoughts. Space Marine undead fighting beyond their death in an armored sarcophagus bristling with with heavy weapons and massive hth weapons. From a fluff perspective, they are a little odd in a Raven Guard army. If they are older vets, they are probably Terran and were likely sent off with the Carcharodons or Ashen claws. If they were post Terran purge, they were lost on Istavan V unless they left some on deliverance. If they were post drop site massacre they are a bit of an oddity. From a tactics perspective, they don't really fit with an infiltrating force but they fit in a drop force or if you are doing an air force.With that in mind, this article won't be an indepth unit review but instead will focus on what I've used or played against and what I think works best for Raven Guard. This is the classic boxnaught. Interestingly, they can be taken in squads of 3 that split up and act independently OR you can take a single dread and take a Legion Dread Pod as a dedicated drop pod. Frankly, there is not much reason to take these. They are only 10 points cheaper than the Contemptor-Cortus Class Dread, which does everything better. This is your rear guard anti air option. The Helical targeting Array opens up skyfire and interceptor. The obvious choice is 2 twin-linked auto cannons and 2 hunter kill missiles with unlimited range. Note that this is more fire power than you can get for a contemptor version and it's cheaper. I really like the 2 twin kheres assault cannons. It's a ton of dakka that threatens just about everything. 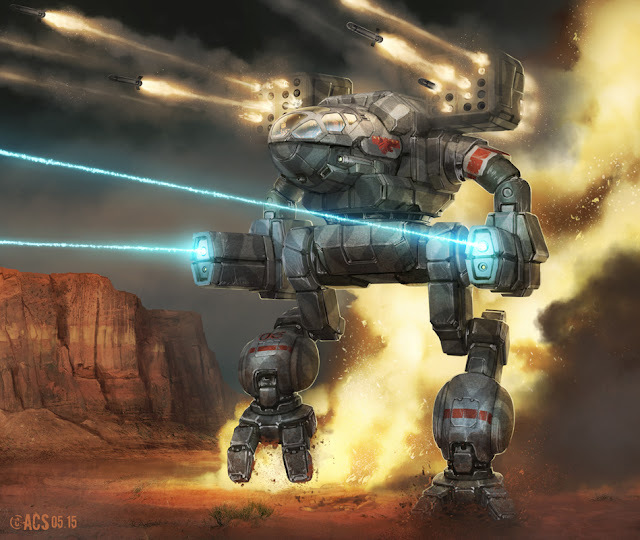 You could use this as an anti air platform but it really just more expensive and let dakka than the mortis dread alternative. It should be mentioned that you have to use skyfire and interceptor together... so something like multi meltas aren't as interesting as they originally look. This is pretty much the only dread I would recommend that is walking and not anti air. In other legions, these are your rear guard or mid field contemptors. They are resilient, have good armament options and can be good counter charge units. 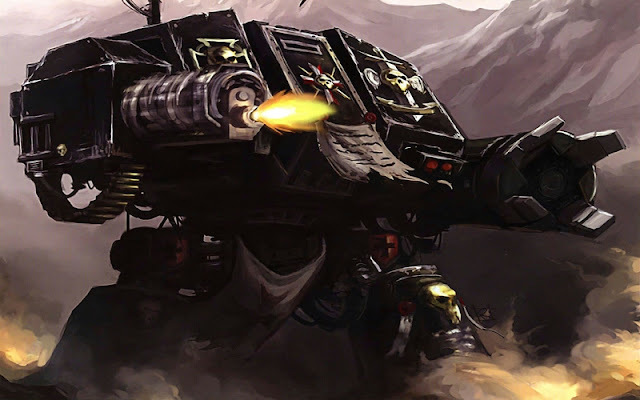 In a Raven Guard list, they are solid in a drop pod. The trick is to take 2 Dread CCWs or a chain fist and replaces the inbuilt twin-linked bolter with graviton guns. Not only are they a way to get some serious hurt on a Spartan Turn 1 they force your opponent to have to deal with something nasty up in there grill. For 40 pts less you can field a contemptor with one less side armor, atomic shielding in the front only, no 6+ in hth, and 1 less pip of BS and WS. BUT you still can take 2 dread ccws and 2 graviton guns and you pick up move through cover and atomic overcharge. 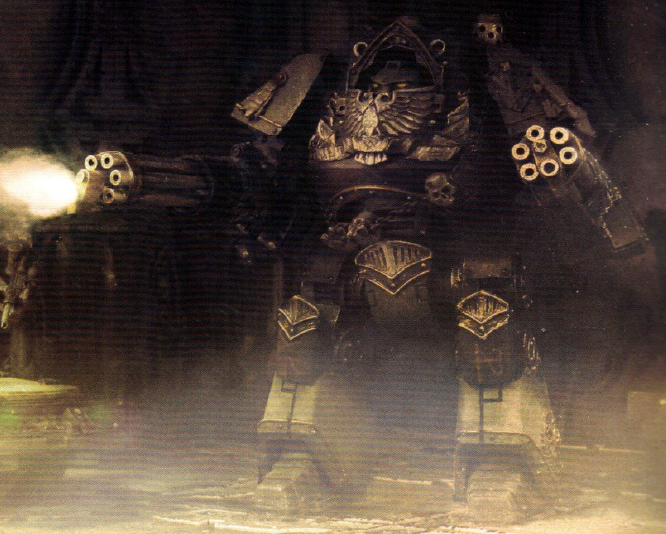 So in short, the cortus is a glass cannon version of the contemptor. Truthfully, it's just nice to have the option when your trying to fit one of these beasts in a smaller list, but in general I try to take the full contemptor version. 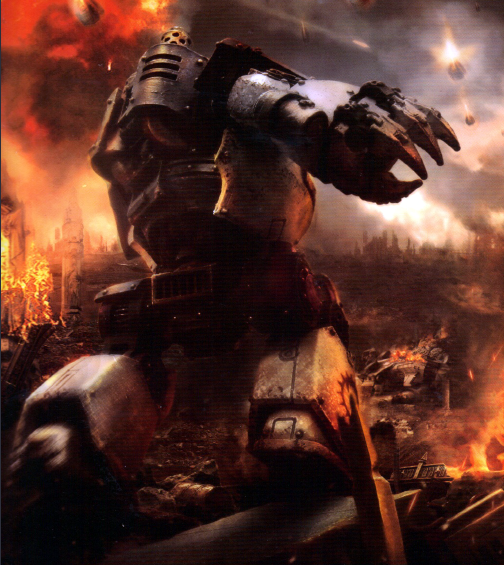 This is your long range contemptor. It has a lot of weapon options that are viable, but at the end of the day Raven Guard are always looking to close the gap on tank hunting. I prefer the stand anvilus autocannon battery over the lascannons. The lascannons are fairly solid, but 50 pts is a lot of extra points to upgrade an already very good gun. It's also worth mentioning the aiolos missile launcher. While it's not a necessary upgrade, it can fire at it's own unit, so really the question is, would you pay 35 pts for 3 60" S6 Ap3 BS5 shots that ignore intervening obstacles? So yeah... it's usually an auto include. I bought this bad boy to run when I field Dynat with my infiltrated Raven guard. (booo hisss). In that scenerio, I run a seige drill with the cyclonic melta lance. As a Raven Guard unit, I actually like it with the grav-flux bombard. The Grav-flux is the absolute king of gutting rapier platforms. So if you are running an infantry heavy list, you can rid yourself of a rapier unit turn one and draw a crap ton of fire away from the rest of your army. In all honesty, I haven't decided my favorite build is yet. It does a lot of everything. There is a lot of love for the phosphex launcher as well, which is a worthy upgrade for 15 pt if you are planning on smashing into HTH. The 2 storm cannons, volites and sposphex is a popular build as well, but I feel the hth helps Raven guard out more than other legion. In the past I always preferred 2 contemptors in pods. Now with the increase in pods, that gets quite expensive. All that said, I wish I could upgrade the flamers with grav guns! First off, Dreads are pretty good anti air units, so if you are looking to rules the skies, you can often get cheaper more effective, more resilient anti air in the form of a dread than you can out of most aircraft or other options. So they are nice way to make airforce lists better and they are units that start on the board, so you don't auto lost before the birds come on. This is the only time I would ever take dreads not in a Pod. That said, my biggest challenge building Raven Guard list is deal with armor. Raven Guard have LOTS of very strong anti infantry options, but when it comes to anti tank we are limited because most anti tank units don't really have much synergy with the Raven Guard rules. Dreads fall in this category. As they don't infiltrate, they don't get the benefit that infantry based anti tank gets out of positioning after your enemies deployment. BUT they do have synergy with some Raven Guard army genres, like drop pod heavy decapitation strike or orbital strike. And they can take advantage of reduced scatter from vox's scattered through out your infiltrate units or from something like Alvarex Maun. On the thread of grav, you need a couple units toting grav for it to be effective and the haywire combo of grav rapiers, breachers, speeders, forgelords, lightnings and dreads can work really well if you invest in the concept. It should also be mentioned that Contemptors are spectacular because AV13 is immune to krak grenades. So even if you don't do damage with contemptors, they can tie a lot units up nearly indefinitely. We you mix that concept with Alpha strike, you are basically killing a big chunk of your opponent so they can shoot back and then tying up another big chunk so they can't fight back. 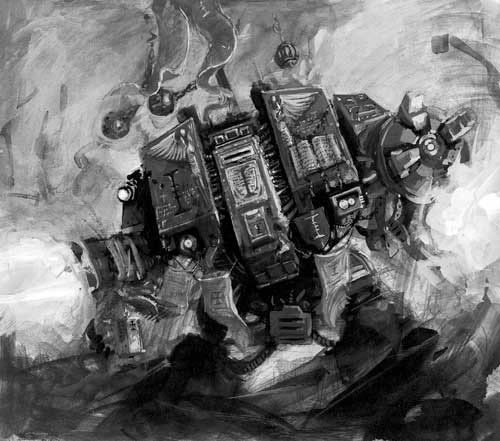 This makes Raven Guard as a legion, much more resilient than they would initially look on paper. It also means you can keep a unit locked into a spot so you can hit them with a unit of dark fury or something made for infantry clearing. It's also worth mentioning HTH. Raven Guard don;t really have great HTH characters that can go toe to toe with other Legions HTH characters. We generally try to shoot them to death. Dreads on the other hand can often just oblit most characters. While it seems unlikely that you could force this situation, I actually find that it happens often. Consider frying a retnue with flamer mor deythan in the proximity of where you dropped in a dread. It's like the character will be standing in the open ready to be charged. Finally, with the recent change to drop pods, I would suggest always taking a anvillus pattern dreadclaw drop pod over the legion dreadnought drop pod. It's just better and gives you more options for 15 more points. That said, leviathans are forced to take the standard legion dreadnought drop pods. Beyond pods, you have a couple super heavy options, which is awesome but is definately only viable at huge point costs. Lol. So read another blog. I type most of these on a phone.